Just in time for Spring Break – get intro pricing on a Brazilian Blowout package and keep your hair looking it’s best all summer long! 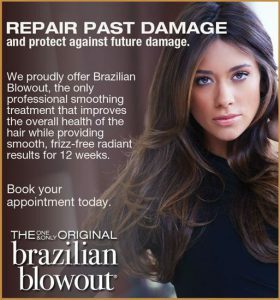 Brazilian Blowout is the ONLY professional smoothing treatment that improves the health of the hair with No Damage! and No harsh chemicals! Through the use of their Super Nutrient Complex proprietary polymer system, the Brazilian Blowout actually improves the condition of the hair by creating a protective protein layer around the hair shaft to eliminate frizz and smooth the cuticle. The end result is smooth, healthy, frizz-free hair with radiant shine! The results are immediate and unlike other smoothing treatments there is NO down time! You will have the ability to blow dry your hair in a fraction of the time you’re currently investing and humidity, rain or sweat will no longer affect the longevity of your style. On most hair types, the results should last for 10-12 weeks if the Brazilian Blowout Acai Hair Care product line is used. The Brazilian Blowout is a cumulative treatment, in that the more you receive it, the healthier the hair will be and the longer the result will last. If you schedule your first Brazilian Blowout treatment with our newest talent, Laura, before April 15th for the low introductory price of $200, we’ll give you the same pricing on your next treatment with Laura if completed by July 15th! This means you’ll get two seasons of frizz free, low maintenance hair for just $400! Laura is a super cutie and our clients have had nothing but great things to say about her talent. Check out her latest reviews on Yelp, then schedule your Brazilian Blowout with her today!